Home > Learn > The Basics > Alzheimer's FAQs > Is Alzheimer’s inherited? The keynote speaker at a recent Alzheimer’s Association conference had just wrapped up his presentation and asked for questions when a caregiver rushed to the microphone, “Doctor, am I going to get Alzheimer’s disease too?” she asked worriedly. While many people are becoming a bit more forgetful because they aren’t exercising their brains, Troxel affirms that periodic memory lapses aren’t usually a sign of early Alzheimer’s, particularly in younger persons. So, are you more likely to get Alzheimer’s if one of your parents have the disease? Here is a summary of the current thinking about the inheritability of Alzheimer’s. Alzheimer’s disease does run in some families, particularly in early onset cases in which someone gets the disease well before the age of 65. Fortunately, these devastating cases represent less than 5 percent of all diagnoses. If you have a parent or sibling in this situation, you may want to get him or her evaluated at a university research center. You may also want to undergo genetic testing yourself to better understand your family situation. If you still want to assess your risk, you can talk with your physician about genetic testing. The most common test looks at a gene called APOE (apolipoprotein E) found on Chromosome 19. You receive one gene from your mother and one from your father. The test reveals whether you have an APOE 2, 3 or 4 from your mother and your father. A 2/2 combination seems to actually protect the brain; an APOE 4/4 greatly increases your risk. Most medial professionals discourage blanket genetic testing, at least in its current form. An APOE test demonstrates risk but is not definitive. It will also not tell you when you will get Alzheimer’s—at 70, 80 or 95. This makes the information hard to use on a practical basis. While the evidence is not definitive, getting plenty of exercise, not smoking, controlling weight, eating a heart-friendly diet, and staying socially and intellectually active may help delay the onset of Alzheimer’s disease, or may even prevent it. If you have experienced Alzheimer’s disease in your family, take these positive wellness steps. They cannot hurt you but may help quite a bit! Get moral support and Alzheimer’s resources in your Facebook feed by liking our Remember for Alzheimer’s Facebook page. 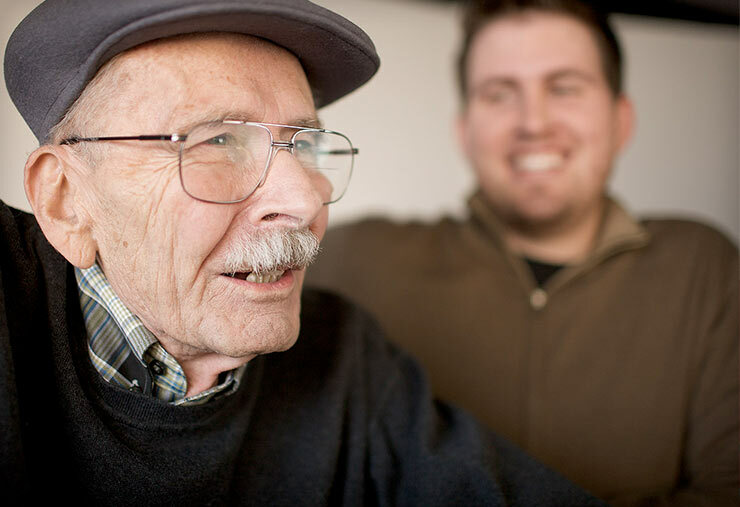 To find a caregiver in your area, contact your local Home Instead Senior Care office.